There are poetry walks and there are poetry walks. Some poetry walks are events — people walking from place to place, with readings along the way to celebrate Poetry Month (April) or the birthday of a poet. Some of these have become long-running institutions (Petaluma, California, and the Poetry Walk Across the Brooklyn Bridge, for example); some are one-time events (Gale School, Chicago). Passing Stranger is a downloadable, self-guided poetry walk of New York City’s East Village. Not exactly a poetry walk but still worth mentioning, the Fish Quill Poetry Boat is an annual poetry paddle: six poets on tour by canoe along Ontario’s Grand River. Then there are the poetry walks where poetry has become part of the landscape, of which the Sue C. Boynton Poetry Walk in Bellingham, Washington, is one of a growing number. Some of the others include poetry walks in Berkeley, CA; Charlottesville, VA; Santa Fe, NM (also here); Takoma Park, MD; and Mirehouse and Kirkby Stephen, both in England. In Seattle, Mary Kollar has initiated a do-it-yourself poetry walk at her Capitol Hill home. Portland, Oregon, provides an online map of its many poetry boxes and poles. You’ll find a growing section of Poetry Walks links in the sidebar, at right. 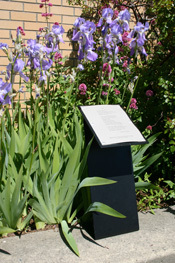 The ten Walk Award-winning poems from the Sue C. Boynton Poetry Contest are displayed for a full year on the Sue Boynton Poetry Walk in front of the Bellingham Public Library. The long flower bed fronting the library is maintained by the Birchwood Garden Club and is a constantly-changing panorama of the seasons. Come stroll the Poetry Walk now to read the 2015 Walk Award poems, which will remain on display until July 2016, when they are replaced by the 2016 winners. This blog regularly includes posts about new (or newly-discovered) poetry walks around the world. Here’s a link to posts tagged poetry walk. There’s also a list of links to poetry walks in the sidebar on the right. Go see some poetry. How did you determine the type of materials to use for the walk? Where did you seek funding? How long did it take? What was the total cost? The much appreciated 2006 article by Norm Roulet about my sculptural tribute to the Ohio poet Hart Crane mentioned the silhouette of an oar boat. I wanted to let everyone know that the image came from actual work drawings for the ill-fated Edmund Fitzgerald. I felt it was appropriate to Crane’s life.